I've just learned that These Vampires Don't Sparkle is now available. 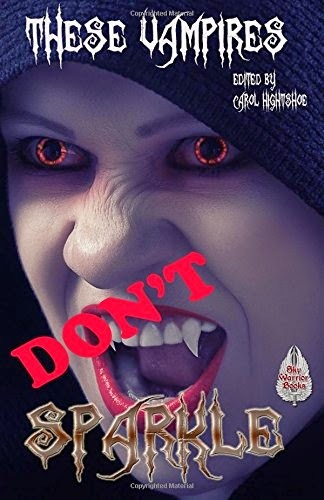 Edited by Carol Hightshoe and published by Sky Warrior, the book contains my story "Crosses," which is about a vampire who becomes obsessed with crosses. It's based on my novel The Brotherhood, as it contains the same characters but is a freestanding story. Available from Amazon in kindle and print if anyone's interested. My chess story got quite a few hits. I love chess, though I don't get to play as often as I'd like. My absolute biggest disappointment was when I arrived at high school and discovered the school had no competitive chess team. Since some schools in Oakland, Berkeley and San Francisco had some, I had visions of playing chess competitively. Never happened. I was really disappointed. A few students informally played during lunch. but it wasn't the same as mopping up another school with chess brilliance. “Sure,” one of the bewildered boys replied. There were three of them. She knew Kevin from geometry class. The other two boys were sophomores. At least there weren’t any freshmen. They all looked bewildered. A girl was standing in the chess club. And not just any girl, Heather was the undisputed hottest girl in the school. What is she doing here? The boys were all silently wondering. “You can have white,” Kevin answered. He opened his own can of soda and took a drink. Heather took a sip of Coke and moved out the king’s pawn. The next few moves were uneventful. A knight was traded for a bishop by Kevin. Then Heather stumbled and lost a rook. Heather chugged down her remaining soda. “Thanks for the Coke.” She stood up and walked out of the chess room. “What’s with you?” one of the guys asked. None of the dogs on the birthday cards had goggles on. If someone launched a line of greeting cards that featured dogs in goggles, well that would be something. Well, I just learned that the Horror Writers Association (HWA) passed a bylaw amendment allowing self published writers to become active members. There isn't even a good way to verify if these people really have the sales they claim. But, anything for more membership dues. Now, this will get people mad at me. 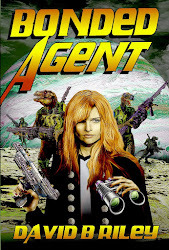 I think self publishers are the scourge of the written world. They choke the market with unsellable garbage and go around saying "this is the new order of things." I am very disappointed with this development. Alas, I seem to be in the minority as it passed decisively. Just got my car back from the body shop yesterday. Dang I hate it when they change my mirrors. And they adjusted my seat. This was a minor body repair to my rear bumper. It was a one day project. There was no reason for the car to need an extensive test drive. So, to move it 15 feet inside the shop they need to mess with my mirrors and my seat? Me thinks not. They did a nice job fixing my car. But why mess with my settings? Bugs me, it does. Today, I am suppressing a strong urge to get a rifle and climb up on a tall building. It's format and layout time for the new issue of Steampunk Trails. Some stories come in great shape. Some of them. But, alas, an ever increasing parade are something else entirely. It astonishes me why so many writers think their stories need to look cute. They embed odd features into the text. They use strange fonts. They use headers instead of letting the word processor numbering system work. And they always seem to want to add an extra line between paragraphs. And those are the good submissions. Oh, and let's not forget how half of all submissions come in with courier type in spite of warnings not to use it. Oh, how most editors hate this font. Then there are scores of submissions that have no discernible paragraph. They're just continuous sentences strewn together in some random incomprehensible fashion. And none of them seem to have any resemblance to generally accepted manuscript formats that are published in any of a number of writing books. Gee, I wonder why I can't get published? This is not unlike Woody Allen's quote that 90 percent of success is simply showing up. Simply sending in a clean, simple manuscript greatly improves your chances. In the 20 or so years I've been editing various projects, this situation has gotten much worse. I'm not really sure. I blame, to some degree, certain writers groups that urge on incompetent writer wannabees who are no ways near ready to take off the training wheels. But there's something else going on. When I went insane and decided I should take up writing, I studied Writer's Market and everything else the library had to find out how to submit, how a manuscript should look and everything else I could learn. The savages cranking out submissions today do not, I fear, even know what a library is--let alone a book. And they don't seem too interested in learning. When you tell someone they've got serious formatting issues and, a week later, you get another sloppy mess from the same writer, you start thinking it's time to find a witch doctor and get a curse put on somebody. Truth is, good witch doctors cost money. Ah, fantasies of tall buildings take shape this time of year. I made some toast yesterday. I put some bread in the toaster and when it was ready I put some butter on the bread and ate it. It took forever. Toasters don't cook toast anymore. None of them do. My dad has a really expensive toaster and it's just as slow and useless as my $8 one I bought at Target. I sure wish toasters would cook the toast faster. And, frankly, the bread isn't evenly toasted. There's something wrong with this world. 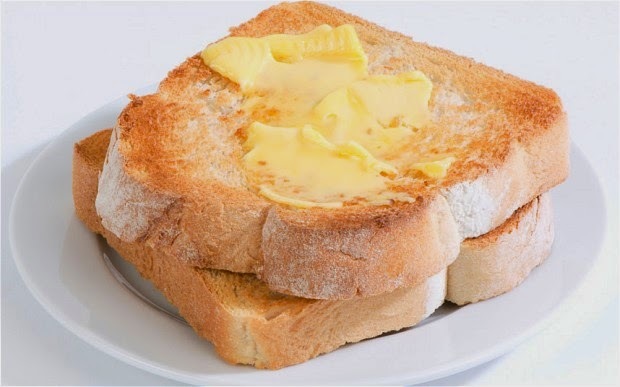 Some evil force is keeping people from having good toast. It astonishes me that about half of the artists I assign illustrations to over at Steampunk Trails magazine never complete the assignments. These are almost all artists who have contacted me seeking assignments. They've agreed to our terms and guidelines. And they never, ever submit the assigned art. And all we're asking for in our case are simple line drawings that require very little time. If they can't do this, they're delusional if they think they're going to be successful artists. Yet this just keeps happening. 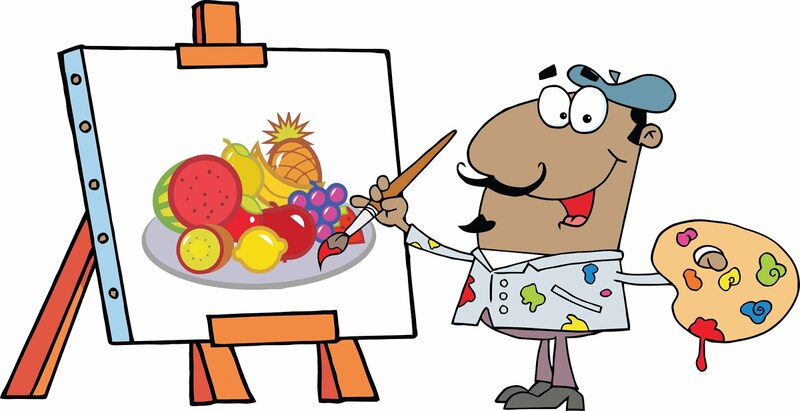 Frankly, dealing with artists is what I hate most about my role as publisher AND art director for Steampunk Trails. If we had more circulation I'd hire someone--but that's not going to happen right now. Maybe I can find a witch doctor who can put a curse on these people. In the meantime, I'll muddle on. So, to all the art directors out there you have my sympathy. And to those very few artists who actually get assignments done on time, I salute you. Just a postscript to my tea diatribe of Tuesday. As I write this I'm sipping on a cup of Earl Grey tea that's not at all bad. And there's no milk or lemon or raspberry or sugar in my tea. It's just tea. I haven't complained about tea in a while. Most of the prepackaged teas that come from the store are polluted with lemon or sugar or peach or all three. I only drink tea that's just tea. Enter the Brits. This British lady decided to have a cup of tea at the hotel I work at. We actually have tea. She said there was no milk, as if I would care about this revelation. I sort of grimaced. "You put milk in your tea?" She seemed shocked at my disgust. Really shocked. "We have coffee creamer," I offered. She decided that would have to do and took the creamer and wondered off to the gates of hell or wherever she was from. The thought of polluting my cup of Earl Grey with milk makes me want to gag. The Brits and Australians practice of putting milk in tea simply makes me gag. McDonald's drive thru always tries to stick me with sweet iced tea instead of unsweet. I don't eat at McDonald's anymore. Leave my tea alone. Some people pronounce bear as bar. I don't know why. Well, we have to keep our trash dumpsters locked up because of them bars. The more they're able to get into the dumpsters, the more they come around. They seem to like garbage more than I do. I don't really want to eat stuff in our dumpsters. There isn't that much in there that seems all that appetizing. If I was a bear, I'd go to 7-Eleven and get some microwave burritos. Of course, most bears don't have any money, so they probably can't afford them. Yogi Bear was partial to picnic baskets. Got my Mile Hi Con questionnaire. Some really interesting stuff this year. sort of wish I could be on everything. Okay, in yesterday's post I may have posted a bit of a fib. Edgar Rice Burrows was about 20 years older than J. Edgar Hoover--so they couldn't have really been the same guy. But they sure look like the same guy. And he didn't really invent Hoover vacuum cleaners or have Hoover Dam named after him. I was simply curious if anyone would call me out on boldface lies--no one did. 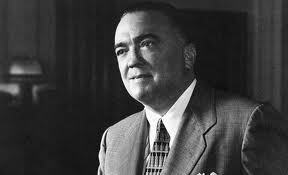 It's common knowledge that J. Edgar Hoover, the famous lawman, invented Hoover vacuum cleaners and that the Hoover Dam was named for him. 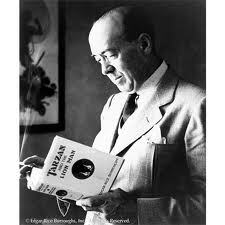 What's not widely known is that Hoover and writer Edgar Rice Burrows (of Tarzan fame) were the same person. Enclosed is my story called "My story." I didn't bother to find out what your name was because I didn't really look at your publication's submission guidelines. I find that is often a waste of time as my story never really fits these rules anyway. I'm sure you'll want to publish my story even though nobody else will. We've been working hard to get the next issue of Steampunk Trails ready to go to the printer. I can't wait until it comes out. The next issue is simply packed full of ripping good stuff. Now, for some reason, there is a mindset that steampunk art needs to tilt toward the hideous. 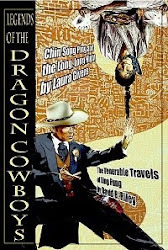 If you look at so-called steampunk anthologies, that is often the case. I have a story in one recent collection that I could only describe the cover as simply hideous. Whether that is by design or the poor judgement of the artist is something I cannot say. But does that have to be the norm any more than the heavy tilt of horror covers towards the wretched black backgrounds? Well, I don't know the answer. 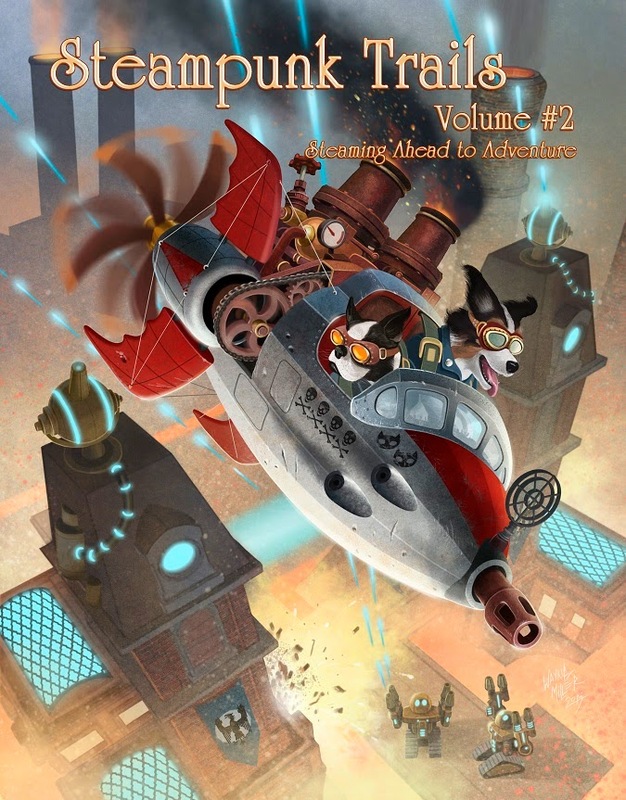 I do know our new cover for Steampunk Trails 2 is anything but typical. We took the risk of being too cute with this cover, but I think it works. Of course, I've always had this strange fascination with dogs in goggles. Not everyone liked my post yesterday about being a bestselling author. That would work, but there's a lot more to it than that. Frankly, a lot of the advise out there from websites, books and magazines is pure bulls*it. I know how to be a bestselling author. It's not really that difficult. Get someone to publish your book. Then get a whole lot of people to buy it. It's that simple. Do that and you'll be a bestselling author. Back many years ago when I was growing up, the 4th of July was a simply wonderful holiday. Now, I don't like it anymore. Back then it was all about fireworks. 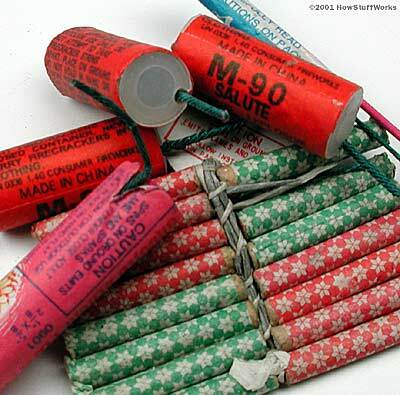 We would go to my grandmother's and blast away, as fireworks were fully legal there. Now, the crowded roads and crowded stores and crowded everything just makes me hate holidays--especially big ones like the 4th.